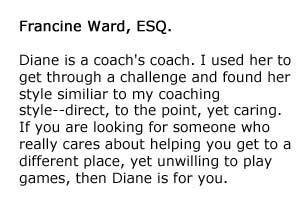 Diane is a coach’s coach. I used her to get through a challenge and found her style similiar to my coaching style–direct, to the point, yet caring. If you are looking for someone who really cares about helping you get to a different place, yet unwilling to play games, then Diane is for you.